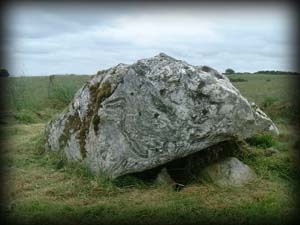 Above is tomb 51, also known as Listoghil, the tomb stands on the highest point of the Carrowmore complex, the only tomb definitely covered by a cairn and also the largest in the cemetery, the cairn is 34 metres in diameter. The tomb was partly excavated in the 1990s by Swedish archaeologist Goran Burenhult. 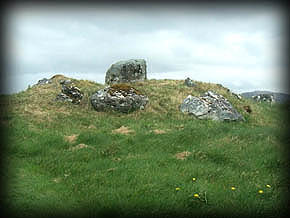 Over the last few years work has been carried out on this huge cairn by the Office of Public Works, exposing the chamber pictured below, which now has a public viewing platform built around it. 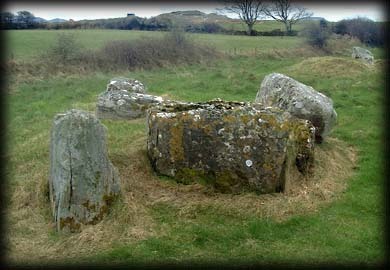 The chamber that stands inside the cairn is pictured below. 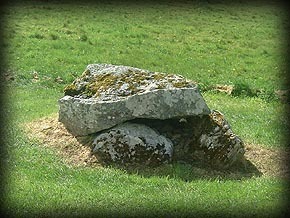 Tomb 57 is just a short distance north of tomb 56. 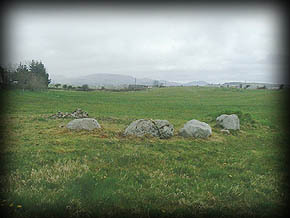 This circle consists of 33 large contiguous boulders and almost 20 metres in diameter. There are no visible signs of a cromleac, which may have been destroyed. part of the circle is on private land. 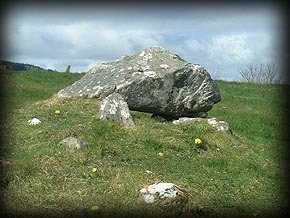 Situated: Two miles south west of Sligo Town, Carrowmore is well signposted and has a visitor centre car park. If heading from Dublin take the R292 for Strandhill and turn right at Redgate cross roads the centre is approximately half a mile down this road on the right. Opening: March-October. Daily 10.00am -last admissions are at 5.15pm (Car park closes 6.00 pm) Admission is €4.00 Adult, €3 Senior/Group, €2.00 Student €10 Family. Discovery Map 25: G 6614 3368. Last visit Sept 2010. Longitude: 8° 31' 10" W, Visitor Centre. Latitude: 54° 15' 3" N.